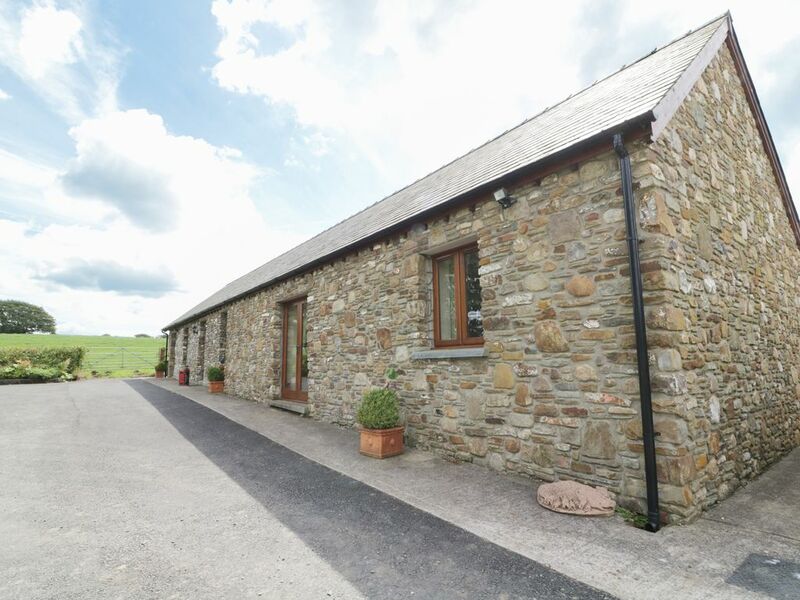 Ysgubor Hir is a barn conversion situated in the hamlet of Llanedi, three miles from the town of Pontarddulais, and within driving distance of Swansea. This cottage sleeps six people in three bedrooms, consisting of one ground floor king-size double with en-suite shower room, a ground floor double and a first floor twin, as well as a ground floor shower room and a ground floor bathroom. The cottage also has a kitchen with dining area, a utility and a sitting room with an electric woodburner-style stove. Outside the cottage is off road parking for four cars and a raised rear lawned garden with patio, furniture and barbecue. Ysgubor Hir is an ideal base for walks, cycle rides and visiting castles and the coast. Amenities: Oil central heating with underfloor heating on ground floor and electric stove in sitting room. Electric oven and hob, microwave, fridge, freezer, washing machine, dishwasher, TV with Freeview, Blu-ray DVD, WiFi, selection of books, games and DVDs. Fuel and power inc. in rent. Bed linen and towels inc. in rent. Cot and highchair. Off road parking for 4 cars with room for boat on trailer. Rear raised lawned garden with patio, furniture and BBQ. Sorry, no pets and no smoking. Shop 3 miles, pub 1 mile. Note: Shallow open stream runs along the edge of the front parking area - small children to be supervised. Note: Owners can arrange a grocery delivery for guests prior to their arrival, by arrangement. Town: Pontarddulais offers shops, tea rooms, restaurants and pubs, free tennis courts and a male choir. It is located 10 miles from Swansea, where you can enjoy the theatre, cinemas and shopping centres. Swansea is also home to a great leisure centre (LC2) and the Liberty Stadium. Llanelli is 9 miles away, where you will find Parc y Scarlets, while a few miles further is Pembrey Country Park with a cycle track along wooded valleys and beaches. Venture to The Mumbles and the Gower Peninsula with its beaches and cycling, walking, horse riding and golfing, with surfing available at Llangennith. Head north to the Black Mountains and the Brecon Beacons National Park with its castles, caves and waterfalls. Approximately 16 miles west is the ancient market town of Carmarthen, the gateway to mid-Wales. A perfect location to discover this beautiful part of South Wales. Three bedrooms: 1 x ground floor king-size double with en-suite shower, basin and WC, 1 x ground floor double, 1 x twin. Ground floor bathroom with bath, shower over, basin and WC. Ground floor shower room with shower, basin and WC. Fitted kitchen with dining area. Utility. Sitting room with electric woodburner-style stove. Oil central heating with underfloor heating on ground floor and electric stove in sitting room. Electric oven and hob, microwave, fridge, freezer, washing machine, dishwasher, TV with Freeview, Blu-ray DVD, WiFi, selection of books, games and DVDs. Fuel and power inc. in rent. Bed linen and towels inc. in rent. Cot and highchair. Off road parking for 4 cars with room for boat on trailer. Rear raised lawned garden with patio, furniture and BBQ. Sorry, no pets and no smoking. Shop 3 miles, pub 1 mile. Note: Shallow open stream runs along the edge of the front parking area - small children to be supervised. Note: Owners can arrange a grocery delivery for guests prior to their arrival, by arrangement. Hervorragend ausgestattetes Cottage ca. 20 km von Swansea entfernt. Wir wurden auf das herzlichste von den Eigentümern begrüßt mit einem Korb voller Süßigkeiten, Wein und kleinen Snacks. Die Ausstattung ließ keine Wünsche offen, wir fühlten uns im Haus sowie im Garten sehr wohl, der Platz war reichlich, für 6 Personen gibt es drei Bäder. Der elektrische Kamin und die Fußbodenheizung sorgten für behagliche Stunden. Das Haus ist bestens gelegen wenn man Swansea und die Halbinsel Gower besichtigen will. Aber auch der botanische Garten und viele weitere Sehenswürdigkeiten befinden sich in der Nähe. Die Besitzer waren sofort zur Stelle als wir ein kleines Problem mit der Heizung hatten. Wir können dieses wunderbare Cottage sehr empfehlen.